The TQC Tripod Stand for Viscosity Cup is a stand that is easy to level with the adjustable feet of the unit and the built-in spirit level. 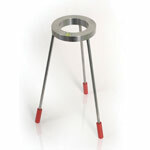 The ring is made of stainless steel, the legs are made of stainless steel and the feet PVC. Suitable for all DIN, ISO and ASTM viscosity beakers. Klik tombol di bawah untuk menambahkan Viscosity Stand ke Daftar Keinginan Anda.